It has been more than two months since President Trump's inauguration & ObamaCare's legal status has not changed – it has not been "repealed on day one" by Trump & it certainly has not been "torn out root & branch" by Senate majority leader Mitch McConnell. 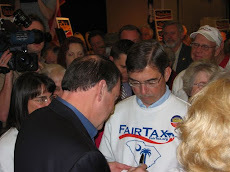 Instead, since the inauguration, ObamaCare has been the subject of the legislative process involving "repeal & replace" or as preferred by some Members of the Republican Congress simply "repairing" ObamaCare – to which there is no effective difference between either of these approaches or even leaving ObamaCare in place. Any one of these three alternatives results in politicians picking & choosing this benefit or that penalty to coerce Americans to buy a product many do not want. I thought the idea of America was freedom but all of the above approaches result in a theoretical government mastermind thinking it knows what is best for us rather than us being able to choose for ourselves. We should be trying to get away from government healthcare, systems, & dependence thereby preventing the growth of socialism so that America returns to the liberty to abundance stage of our history. This is reason enough to be against adding another government program. Speaker Paul Ryan's American Health Care Act (AHCA) emerged as the leading replace &/or repair legislation & it prompted many responses like this one from subscriber SRK – "I hope that Trump does not fall for Ryan's healthcare plan." The AHCA has been derogatorily dubbed ObamaCare Lite, ObamaCare 2.0, & RyanCare. Well, Trump not only fell for Ryan's AHCA approach – he was all-in for it - & it still could not get the votes to bring it to the floor before it was withdrawn from consideration – the final version of the bill would have received only 100 votes – source Joe Rago, WSJ editorial board member. Even if the AHCA had passed the House by the barest of margins it would have gone through major revisions in the Senate that would have brought it back to the House for reconciliation before proceeding to the White House for signature – an improbable process. The problem with the AHCA in the House is clearly seen by understanding that Congressmen Frelinghuysen & Lance were against the bill because of the loss of their constituents' Medicaid coverage & the Freedom Caucus members were against the bill because of the Medicaid coverage of Frelinghuysen's & Lance's constituents plus many others. In addition thirty-one governors (pitifully 16 Republicans outnumbered 15 Democrats) had expanded Medicaid eligibility in their states & they did not want to see this coverage reduced. Obviously many Republican congressmen & governors view success by how many of their constituents are on Medicaid or receive government subsidies to pay for their healthcare insurance premiums or better yet premiums & co-pays. Now the danger of tinkering around the edges instead of getting rid of ObamaCare is vividly displayed when you realize that healthcare insurance premiums & deductibles are going up again in 2018 if ObamaCare is left untouched. If the AHCA had passed into law replacing ObamaCare, premiums & deductibles would have gone up even more. So why would the Republicans want to let the Democrats off the hook scot-free & be seen as the ones responsible for large healthcare insurance premium increases – even if there are projections of healthcare insurance costs going down several years from now. Nobody will get that message & the hostile anti-American media will certainly not present it. What Republicans were thinking with the AHCA approach has never been explained to me by the many readers of this blog who actually told me they were glad to see the AHCA fail. What was Trump thinking, with such varied resistance to Ryan's bill, following this path in his first legislative effort after earlier feeling the sting of a judicial rebuke of his travel ban executive order where a bunch of statist judges made up law to overrule his clearly constitutional executive order – & so far he has gone along with that defeat also. Many people, including me, became concerned when the "repeal on day one" & the "torn out root & branch" swaggers of the campaign were dropped & talk of replacing &/or repairing ObamaCare surfaced. The original campaign rhetoric was for repeal only. 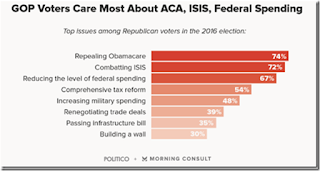 See chart below – notice the top issue is for "repealing ObamaCare", not "repealing & replacing or repairing." After more than sixty House votes over the years to rollback all or part of ObamaCare the Republican controlled Congress was finally able to pass a clean repeal bill in January 2016 for BO's signature - which of course he vetoed. Right after BO's veto Ryan said "It's no surprise that someone named Obama vetoed a bill repealing ObamaCare. But here's the thing. The idea that ObamaCare is the law of the land for good is a myth. This law will collapse under its own weight – or it will be repealed. Because all those rules & procedures Senate Democrats have used to block us from doing this? That's all history. We have now shown that there is a clear path to repealing ObamaCare without 60 votes in the Senate. So, next year, if we're sending this bill to a Republican president, it will get signed into law." Emphasis mine. So what happened – why was the January 2016 repeal bill not dusted off & presented for Trump's signature on day one thereby fulfilling the original campaign promise? Was the congressional passage of an ObamaCare repeal bill just symbolic (i.e., a waste of time) because Republicans knew it would never get past BO's veto thereby saving them from any responsibility while looking tough? The hollowness of Ryan's statement above as clearly seen today is all the more troubling. So does Trump have the congressional horses to pull the healthcare insurance wagon out of the swamp? – you could not prove that he does by the above feckless account. On Friday Ryan said "we are going to be living with ObamaCare for the foreseeable future." But there is a strategy Trump could employ to prove Ryan's analysis of the foreseeable future wrong & it is the one he works best; namely, going on to the rest of his agenda talking directly to the people but also taking every opportunity he has to point out exactly why ObamaCare will fall in the foreseeable future due to its own weight. Instead of just saying ObamaCare is a disaster Trump needs to clearly explain why it is a disaster so that people who are participating in ObamaCare will see just why it will fall due to its own weight in the near future leaving them uninsured. Trump needs to show how the ObamaCare premiums are increasing because insurance companies are losing money. See graph below. 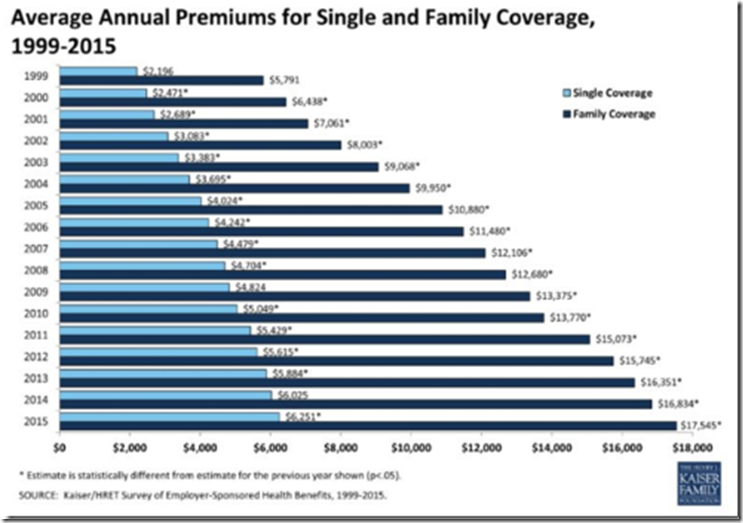 The above graph shows the type of premium increases people not eligible for subsidies pay under ObamaCare. For people who do receive subsidies the following table shows that the taxpayer is the one who pays for the type of premium increases shown in the above graph. 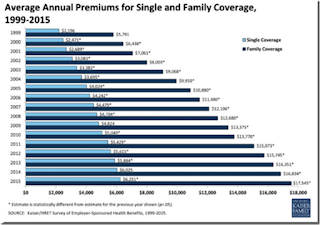 The person who receives subsidies can keep their subsidized premium payments very stable in the examples provided in the table below based on a government formula that relates 1) where you live, 2) your family income, & 3) the amount a family is expected to pay based on a sliding scale of 2% to 9.5% of family income. Click here to bring up a calculator from the Kaiser Family Foundation that provides subsidy estimates for families of varying characteristics – just plug in a few numbers & the calculator will work the formula for you & show you how ObamaCare subsidies are determined. Click on the table to enlarge. NOTES: In areas in which the two lowest-cost silver plans have the same premium, the next lowest-cost silver plan is used as the "second-lowest" silver plan. In some cases, a portion of the second lowest-cost silver plan is for non-essential health benefits so these values may differ from the benchmark used to determine subsidies. SOURCE: Kaiser Family Foundation analysis of premium data from Healthcare.gov and insurer rate filings to state regulators. For more information see "Early Look at 2017 Premium Changes and Insurer Participation in the Affordable Care Act's Health Insurance Marketplaces" Jul 2016. 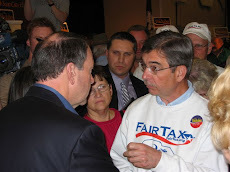 But even if the recipient of the ObamaCare subsidies hold their actual premiums constant they still have the problem of reconciling the amounts of the subsidies with the tax credits paid to the insurance companies on their behalf with the Internal Revenue Service (IRS) @ the end of the tax year when their income tax return is filed. 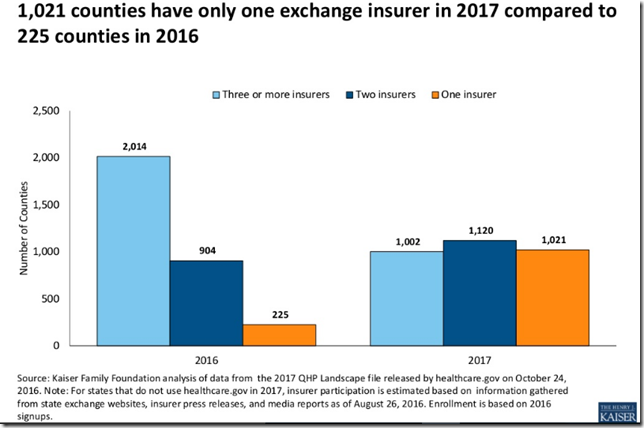 In addition the number of insurers is shrinking from the ObamaCare exchanges – United Healthcare, Humana, & Aetna have all dropped out of ObamaCare participation because they were losing money. Accordingly, 32% of counties will have one exchange insurer in 2017 compared to 7% of counties with one insurer in 2016. See table below for more. Now all of this gives Trump plenty of information to work with in explaining directly to the people what healthcare insurance disaster is coming their way. In addition Trump can erode the foundation of @ least part of the ObamaCare law by lessening the requirements that people pay penalties for not having healthcare insurance & he can put work requirements in place on otherwise healthy people who receive Medicaid. This approach will also be a golden opportunity to show the benefits of letting people buy healthcare insurance across state lines – something that the statists masquerading as our elected representatives don't want to see happen. In essence Trump has to be Trump – not relying on Ryan or any other career politician. The AHCA failure should move Trump way up the learning curve – he needs to acknowledge in his heart of hearts that he was rolled by the career politicians on this first one & now he alone must lead - counting on himself, Pence, Kellyanne, & a very few others - & just have the career politicians follow as they get the message from their constituents. If this doesn't work we have nothing anyway. Trump will have to study all the information hereinbefore & provide even more vivid examples including presenting people like many subscribers to RTE who have lived what they tell me is a nightmare – if only trying to reconcile their ObamaCare subsidies with tax credits with the IRS. If it is desirable to give Americans choice – & Trump campaigned on having a country ruled by the people instead of corrupt politicians - wouldn't it be best to clearly explain why ObamaCare is going to fail so people can choose their own remedy & get behind the repeal of this socialist law. After all, even if there is a shortage of insurers there still will be penalties for not having healthcare insurance under ObamaCare – a real catch 22. Click here to hear Judge Napolitano sum up the entire healthcare matter by eloquently explaining the difference between goods & God-given rights. If the American mindset followed the points from the judge's presentation we wouldn't be in the predicament we are in & have been in the past seven years. Problem is an old and universal one. While Republicans speak of free markets and limited government they truly don't believe in those ideals. Ryan is a perfect example. Btw: your point about projected decreases in future year's insurance premiums ? The only way that can happen is huge reduction in healthcare services or by bookkeeping tricks on par with the social security and Medicare book cooking scams. One final point. You cannot have 300 million people file over 1 billion claims per year and 1) call from it insurance, in the true meaning of the term or 2) make it affordable when all the rules, regulations and socialism are rolled up into it. This Ryan debacle is damaging the economy due to continued Obamacare mandates, taxes, socialism. Drain the swamp. Bye bye Ryan. Markets were anticipating economic benefits from Obamacare repeal, and with resulting momentum - tax cuts and reforms to further catapult the economy forward. Now all this is in jeopardy! Trump must concurrently rework ObamaCare and tax reform, effectively market their economic benefits. Else- markets may respond negatively anticipating what BO apologists called the new normal - 1-2% GDP growth. These views are exclusively mine and not my employer's. I agree with DC's comment about Republicans not truly believing in free markets and limited government. As RTE stated all the previous votes to repeal were just symbolic - Republicans knew it didn't matter. When it does matter, like now when they could make effective changes, they have no courage to shake things up. Their jobs come first and we voters keep letting them get away with it by reelecting the same bunch of nothings to Congress/Senate. It was very illuminating to learn that those getting subsidies will not be affected by the rate increases. Just how much more can those who are carrying the load on every government giveaway bear? I hope that Trump digs down deep and instead of saying the words of change that got him elected, he really learns to understand the issues in order to lead the legislators the right way. He's still got us who elected him and he must be specific when talking to us about his solutions. I trust Mike Pence and want Trump to rely on Pence's experience in the House to get the changes he campaigned on realized. It just sickens me to know that for 4 years President Trump will have no cooperation from the Democrats. Good job Doug. Even I could u durst and this article - except for the charts.